Doctrine of Colours: How to work out what colours will come out like when you add them to your hair. In medieval times, when monks ran apothecaries, and medicine came from plants, and Brother Cadfael wasn’t a character played by Derek Jacobi (although he does a stunning job), there was something called the Doctrine of Signatures. This was basically the way new plants were given uses, in an absence of any other information about the plant. For example, liverwort is a plant that was used to heal the liver because it has liver-shaped bits (liver: a distinctive shape). Heartsease has heart shaped leaves, and this led people to believe it would help the heart. Culpeper, the famous herbalist, wrote about this in his book Culpeper’s Herbal (not light reading). More general shaped plants such as Common Plantain were seen as a cure all because they didn’t resemble any specific part of the body. Purple: Will neutralize yellow, aka “brassy tones.” Many people try to use it to get rid of orange. It doesn’t work on orange. Blue: Works on orange tones. Blue will neutralize orange so you can get a cool dark blonde shade. In order to do this, it might make your hair look browner, because that unnatural orange + blue will add up to light brown (also, this is how to get light brown hair – take it to orange then add the right amount of blue). Green: Works on red tones. Green is unpopular as a hair product colourant but if it was more popular, you could use it to get rid of a bright red if you wanted to turn your hair brown again, or to get rid of a tomato stain, although it will keep the darkness of the red staining. Yellow: Makes hair yellow. It’s a relatively large colour molecule so it stands out with minimal interference from outside products. Orange: Makes hair orange. It’s also a large colour molecule compared to purple or blue. Will mostly wash out when added to light blonde hair, meaning you might need to repeat-colour it to make it stick better. Red: Makes hair red. Use a permanent red or orange before trying to dye blonde hair back to brown it makes the brown stick for longer and the colour comes out better. Will mostly wash out when added to light blonde hair, leaving a reddish tinge, so repetition may be necessary. White: Will not change hair tone. Black: Avoid like the plague if you are blonde. Grey: may add grey tones to your hair. Are you wondering this: Why do half the colours just go the same colour and the other half go to a different colour? It’s to do with the base colourings of hair. Inside the hair shaft, all the way up to pure white, there are colour molecules of red, orange and yellow, of varying proportions. The red orange and yellow molecules inside your hair are much larger, which is why it takes more effort to remove them than the blue, green and purple molecules. By the time you take your hair across to white or silver, there should really only be a bit of yellow left in any visible amount. You can’t get rid of every yellow molecule or your hair would be empty inside, like a drinking straw, which would be transparent and easily squashed (which it is to a fair extent at yellow, but it would be worse than already). At the point at which there are no colour molecules at all left inside the hair shaft, the hair turns to jelly and dissolves. You need to leave some slight amount of yellow tones in your hair. Personally I prefer to take my longer layers of hair to a slightly brighter yellow than the internet recommends – I keep it at that day glo yellow, rather than leaving the dye on until very very pale yellow, then I rely on toning to do the rest. Toning yellow hair is the same no matter how much yellow is left – as long as the orange is all gone, it works fine. The colour result is just a shade of silver that’s slightly duller than it would have been if I left the bleach on for longer, but I feel confident that my hair is safer. I take the top (shorter layers) to palest yellow and it all blends together to give a natural result so I will continue to do this, because the top layers would naturally be brighter than the bottom layers as that’s where the sun would hit if I let my hair anywhere near it without a hat or scarf. This is all super important because in order to get white or silver or platinum hair, you need to know what colours will do what to your hair, and what products to avoid (for example, never put red, yellow or orange coloured shampoos or products on hair that’s white, silver or platinum). 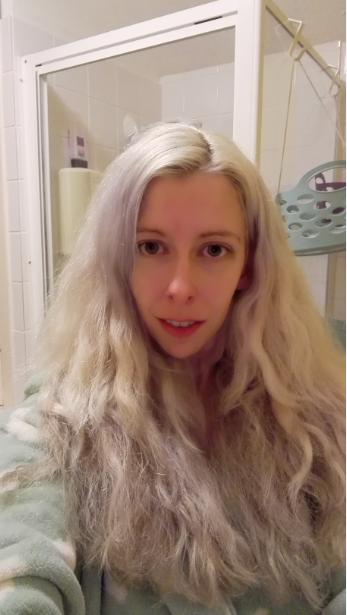 My silver hair Dec 7th 2014; see how the longer layers are intentionally a darker silver than the shorter layers.